Yes, MFF Penang Month may be over but I still miss the flavours of their kerabus, one of the highlights of Penang Straits Chinese cuisine. Heavily influenced by Thai cooking, the northern Peranakans create an assortment of toss-in salads that are light and refreshing yet so flavourful and wholesome, many of them are good as a meal on their own. 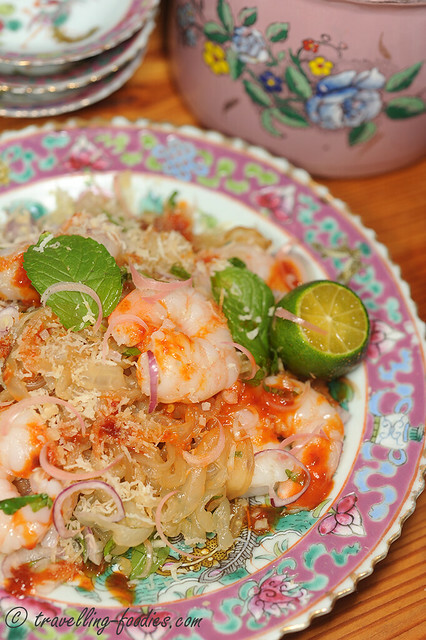 The combination of sambal belacan with lime juice and sugar in the dressing is classic, creating a medley of flavours that makes the dish all the more moreish! Last month, I’d made Kerabu Kacang Botol (winged bean salad) and Kerabu Bok Hnee (wood ear fungus salad) last month for MFF Penang. Here I “reprise” the experience with another interesting Kerabu from Penang Peranakan cuisine that incorporates a lesser known ingredient – jellyfish in Kerabu Hai Tay. The anatomy of a Peranakan kerabu is pretty much “predictable”. There must be a spicy component intermingled with hints of sweetness, savory and sourness. This is found in the sambal belacan dressing, literally an explosion of flavours despite the relatively few ingredients used. The use of shrimp paste in the sambal also imbues a sense of umami which works up one’s appetite and crave for more! 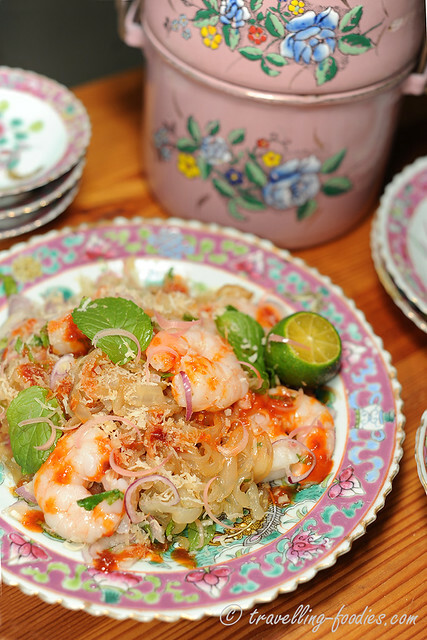 Aromatics are also highly played in Peranakan cooking and Kerabu Hai Tay is exemplary of that. 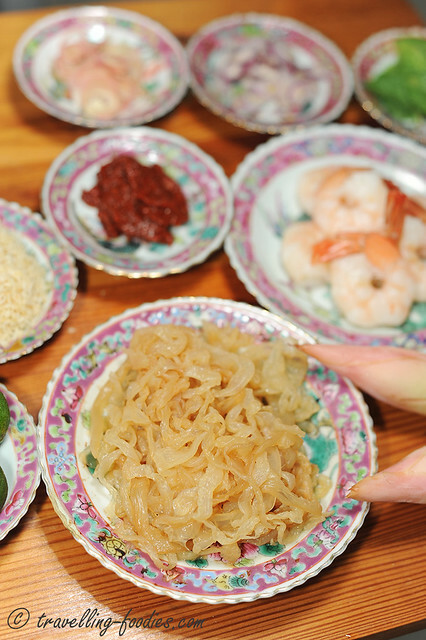 The pungency from belacan paste together with the astringency of freshly sliced shallots work to invigorate the nasal senses, not forgetting the aroma from freshly chopped bunga kantan (torch ginger blossom) and daun pudina (mint leaves), as well as the zesty zing from limau katsuri (calamansi lime). Then there is the astounding visuals that the dish provides, a spectrum in green, red, pink, purple…literally a rage of colours! In short, before one could savour the flavours of the dish, one must firstly be overwhelmed by the “sight and smell” of it! The dish despite its simple construction is also texturally exquisite. In most if not all Peranakan kerabus, there must be a “crunch factor“! Gently blanched winged bean in Kerabu Kacang Botol, raw wood ear fungus in Kerabu Bok Hnee, parboiled chicken feet in Kerabu Kay Kah and now jellyfish and shrimp in Kerabu Hai Tay… there must be a component which works one’s bite and thus appetite. The lingering moments as one repeatedly chomps and chews on these ingredients allows more time for one to better appreciate all the flavours thrown in a simple kerabu. It has been proven by modern day science that the act of mastication promotes and stimulates salivary secretions, but I think the bibiks and nyonyas of yesteryears, the true masters of flavour, colour, texture and aroma knew that long ago already! * for making of sambal belacan and kerisik, refer here. 1. Wash jellyfish and place in a colander or hard-wired sieve over a sink. Pour boiling water over to blanch it. Rinse with tap water to halt the cooking. Drain and slice into thin strips. 2. Combine all the dressing ingredients in a mixing bowl and stir until sugar has completely dissolved. Add jellyfish strips together with all the other ingredients and toss until dressing and ingredients are well combined. Serve immediately. I am submitting this to Little Thumb’s Up “Ginger” event hosted by Alvin @ Chef and Sommelier. This entry was posted on July 31, 2013 by Alan (travellingfoodies). It was filed under Food, Simple Eats and was tagged with Baba, calamansi, daun pudina, jellyfish, Kerabu Hai Tay, kerisik, limau katsuri, mint, Nonya, Nyonya, Penang, Peranakan, prawn, sambal belacan, shrimp, straits chinese, torch ginger blossom. Hi Alan! This is a great appetizer! I’m admiring both your salad and beautiful Nonya plates and serving wares. These Nonya stuff are hard to find these days. Did you inherit them or where did you buy them? Or are you selling them?? ?